BIO BLOCK Firewood Provides the Perfect Combo, Lifestyle + Warmth! 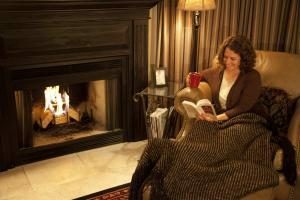 If you are dreading the frigid temperatures, chilling wind and wet snow that often comes with winter’s arrival in two weeks, and lingers for several months, why not consider a new way of enjoying a fire this winter? I often talk with people that love the cozy heat that wood provides but get tired of all of the work involved with traditional firewood. The fun of sitting by a warm, cozy fire is diminished if you have to put boots on to go outside in the cold weather to get wood. When you bring it inside, spiders and ants will inevitably come along with the wood. In addition to carrying dirty wood through the house, ashes must be cleaned every day or two, creating even more dirt! There is a better way! BIO BLOCK Firewood is available in stores across the country now, providing a new way to enjoy a fire in your wood stove or fireplace. It is available with 12 BIO BLOCKS per pack or by the pallet, which contains 88 packs. (1 ton) The beauty of burning BIO BLOCKS is that it must be stored inside. (no need to go out in the weather) BIO BLOCKS provides a hot, consistent fire, which produce little ash, eliminating the stress of cleaning so often. With Christmas only 3 weeks away, who isn’t looking for a way to save time? Plan now to enjoy a warm, cozy fire with family and friends over the holidays. BIO BLOCK Firewood will provide the warmth and lifestyle that you’ve always dreamed of! How will you heat your home next winter? It’s Possible to Save Our Trees & Still Enjoy Campfires!